This post is written for the Keats Blog Tour organised by Katherine of November's Autumn. Keats' odes are really complex criticisms of art and beauty. He wrote to a friend that he worshipped Beauty, and indeed his famous poems deal with beauty - Endymion, Lamia, the Eve of St Agnes, and the Odes. The more optimistic ones especially wax lyrical on beauty. Take, for instance, Ode to a Nightingale, one of the more personal odes (certainly more personal than Ode to Autumn). It is written in first-person, and appears to represent Keats' thoughts as he looks at a nightingale. This is rather Wordsworthian (egotistical), something Keats thought was a flaw in Wordsworth, which makes it surprising it is here. Still, Keats doesn't put himself into everything. In a drowsy state, Keats sees a nightingale, and wishes to escape from the world with the nightingale, which is flying away. Here the nightingale seems to symbolise freedom. There is this great difference between us. He describes what he sees - I describe what I imagine - Mine is the hardest task. The subjective is preferred rather than the objective, which is the crux of negative capability, being content with uncertainties, like Shakespeare, and leaving it to a representation of human nature. This is Romanticism at its finest - feeling against reason, or in this case, imagination against senses. It is quite apt that Byron himself favoured the Augustan poets, who wrote in an age of reason and enlightenment. Keats resolves he will escape with the nightingale to freedom (in this case, he is looking for inspiration), not by imbibing alcohol (Bacchus is the god of wine), which loosens inhibitions, but by the purer light of Poesy, which appears to be a divine imagination. Poetry, and not alcohol is his gateway to freedom, though he admits he is stuck. Then goes on to describe grass, flowers, fragrances and trees, despite not seeing them. Again it might be a reference to his letter to his brother George on him and Lord Byron. Byron wrote what he saw, and here Keats does not actually see anything. 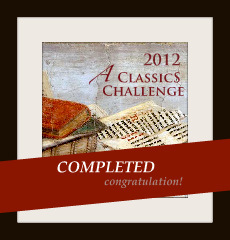 But he "guesses", and by doing so, exercises the power of his imagination, which is more gorgeous than Byron's scenery. Keats muses he has been in love with the idea of death, and it seems that he should die now, painlessly, when the nightingale is "pouring thy soul" with such power, unlike him. But he is incapable of fully appreciating the bird's song. He has been thinking of himself rather than of the nightingale, and realises he is quite forlorn, being uninspired and unsuccessful. Fancy cannot deceive him into delusions of grandeur as it is wont to do; he will not think he can ever attain the status achieved by the nightingale. It is important to recognise Coleridge's definition of Fancy versus Imagination to get an idea. The IMAGINATION then, I consider either as primary, or secondary. The primary IMAGINATION I hold to be the living Power and prime Agent of all human Perception, and as a repetition in the finite mind of the eternal act of creation in the infinite I AM. The secondary Imagination I consider as an echo of the former, co-existing with the conscious will, yet still as identical with the primary in the kind of its agency, and differing only in degree, and in the mode of operation. It dissolves, diffuses, dissipates, in order to recreate; or where this process is rendered impossible, yet still at all events it struggles to idealise and unify. It is essentially vital, even as all objects (as objects) are essentially fixed and dead. FANCY, on the contrary, has no other counters to play with, but fixities and definites. The Fancy is indeed no other than a mode of Memory emancipated from the order of time and space; while it is blended with, and modified by that empirical phenomenon of the will, which we express by the word CHOICE. But equally with the ordinary memory the Fancy must receive all its materials ready made from the law of association. I think Fancy is like fantasising about being rich, or having lots of luxury, and banal things. Imagination is envisioning a whole new world of ideas. But while he's thinking the song fades away, and he can't see the nightingale. He wonders whether it was all a dream, and whether he is awake or asleep. The song of the bird has been mixed with his own dreams, and one wonders whether he was hearing nature itself, or whether his imagination unconsciously constructed a song. Rather like stream-of-consciousness, and it has a sense of immediacy that the other Odes don't. The nightingale represents Keats' desire for immortality and his position as a poet, rather than as a general critique. Ode on a Grecian Urn is Keats' most oft-debated poem. Though less popular than Nightingale, which remains a favourite among many, and less critically acclaimed than the perfect Ode to Autumn, Grecian Urn is more noted for its intellectual qualities, and Keats' theory of beauty. Here the Urn is presented as a piece of art, which contains pictures of people doing things. The language is truly stunning. The urn is presented as something quiet and left untouched and unnoticed; and the drawings on it speak volumes more than the words about it, according to Keats. He wonders what story the pictures on the urn convey. There seems to be men carved on it, and some women, and a pursuit - possibly some men chasing women, who try to escape. He also wonders what passion is present in the story behind it. But there are no words to guide him. : this music, however, is toneless, and one wonders if Keats is merely talking about music. The "spirit ditties" are presumably abstract and not solid. He states the man in the picture cannot stop playing, and can never kiss the woman he pursues, though he seems to be close to attaining this goal - because he is a picture and unreal. But the good thing is, ""she cannot fade, though thou hast not they bliss," and their love will be immortal, because it is an unreal thing carved on an urn and preserved for centuries. This indicates the music is imaginary, belonging to the scene of the urn, to a distant past that Keats cannot access. Then it will forever be spring in the urn picture, and the trees will never shed their leaves. The love depicted on the urn is immortal and heavenly, which leaves him sorrowful, because he knows this cannot exist in real life - it leaves him thirsty. There also seems to be a scene depicting a sacrifice, and a peaceful town empty of people, and because it is imaginary, the streets of that town will be silent and unspeaking - existing in the imagination, rather than a reality. And yet the lovely figures on the urn teases him out of his sense of reality, just the way thoughts of eternity does - is this another expression of his hopes for immortality? It is a "cold pastoral" depicting lovely still scenes, but essentially lifeless, because it is unreal and etched on marble. These last 2 lines are the two most puzzling and often debated in the poem, and numerous theses have been written on the subject. 19th century symbolism was meant to be more direct and less perplexing than the 20th century and now the 21st century symbolists, who aimed to make every minor point symbolic, puzzling and over-intellectual, so the meaning must be one that is fairly obvious. Truth here means reality, which is beautiful, and only the real is beautiful, because it is full of life and is attainable unlike the imaginary unattainable things. A further clue lies in "ye know on earth," because the people who look at the urn belong to the real world, which is the opposite of the non-life depicted on the urn. It is an argument for grounded reality, as opposed to yearning for a world that can never be. Just like the Ode to a Nightingale, it calls for reality rather than escapism. This is interesting, because the first part seems to support an ideal world instead of a horrible real one - and Ode to a Nightingale prefers imagination to the mere senses. It is a progression of arguments within Keats himself about whether art or reality is superior, and in the end he makes his choice, which gives the poem a more natural feeling of a debate within a person. Since Keats seemed to favour imagination, it is possible the speaker is not Keats, and is only a personification of someone interested in beauty and the urn. Then it is possible the speaker disagrees with Keats, representing a sensible person who like many other barbarians (Keats thought his poems were an acquired taste) prefers solid truth to lovely imaginary things. His friend Benjamin Haydon had access to pictures of Grecian urns, and even Keats traced a picture of one, which is presumably where he got his inspiration. Early reviews were both favourable and unfavourable, but today it is considered one of his greatest poems. The problem, thought the critics, was with the images he uses, and indeed Keats' images grounded in literary allusions tend to be short and fleeting - too short fo the 19th century traditionalists, who preferred something more substantial related to that allusion, but short enough for our era, which cannot fix its attention to longer things. Its stature improved in the mid-19th century, when he was long gone, receiving even attention from Matthew Arnold, and favourable mentions in reviews. It is interesting to note both Nightingale and Grecian urn feature songs, except the Nightingale one is immortal and real, whereas the Grecian Urn one is imaginary and belongs to a distant past. Both odes can be said to negate each other in this sense, though both state that man is mortal. An underrated poem, in my poem, is Ode on Melancholy, though not as well-drawn or rich or eloquent as Nightingale and Grecian Urn. The first stanza was cancelled in the published version, so it is important you know the cancelled stanza to get an idea what the next stanza is about. It is full of ghastly images, like some of the pieces of the "graveyard school" in the late 18th century that Wordsworth used to read, rather Gothic - and Gothic poems were taken less seriously than classical ones. Keats loved classical allusions, and may not have wanted to look populist or crude by putting in sensational Gothic elements, and so deleted the verse. The message appears to be, you may put in sensational Gothic things by incorporating bloody death and bones and dragons and monsters, but it will not help you find melancholy - it is sensational or "false melancholy", but not necessarily melancholy. Lethe in classical mythology was a river that made you forget when you drank it. Melancholy here is personified as a goddess, who might or might not be in Lethe, and you will not find her even if you sink into oblivion. The stanza is presented as a quest to find the goddess Melancholy by doing so-called heroic things, a mass of physical spectacles but soulless. 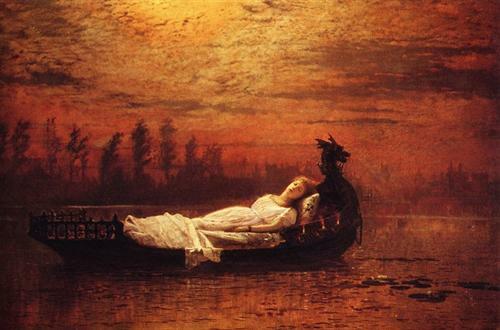 Lady of Shalott by John Atkinson Grimshaw. Note the dragon's head on the boat. I wonder what Keats would have thought of Tennyson's melancholic poem. To get melancholy, do not poison yourself with wolfsbane, or worship death ostentatiously (the night-owl and death-moth are symbols of death), and other grim onstentation. It is a mere "shade" of real melancholy, and making yourself worship all these things will drown you of your "wakeful anguish." Melancholy must come naturally and unbidden "sudden from heaven like a weeping cloud," and here a series of natural images (rain and droopy flowers) are used to convey sadness. Yet melancholy can be overcome: it has its bright side, like a "morning rose" and "globed peonies," symbols of fertility and growth. Melancholy is a source of inspiration, and flowers were 19th century metaphors for abundance and growth and fruition. Anger is beautiful too, because you can see the passionate eyes of your mistress. Then comes the final message of the poem: Melancholy comes with Beauty, and beauty is never without it, because it is transitory. Melancholy too comes with Joy, because you cannot experience joy without melancholy, and here a metaphor is employed: pleasure turns to poison as a bee sips nectar. In the experience of joy, there is a hidden element of melancholy, which is worshipped, and is obviously important. I don't fully agree with this, but perhaps it is the poetic temperament. For some reason many literary figures have felt melancholy all their lives - this may have inspired them - despite periods of happiness, there was the lurking feeling it wouldn't last. Even Keats while in a relationship with Fanny Brawne was worried she didn't love him as much as he loved her. Melancholy seems to rule over Joy - possibly Keats' view that the former tends to overwhelm the latter, and exert more influence. He did suffer from depression for some years, and even happy thoughts could not disguise an inferiority complex, so it explains it. Here Joy worships Melancholy as something greater than him. Alternately it might mean that Melancholy is striving hard to gain a prize called Joy, and this is an achievement, because joy is the antithesis of sadness, therefore making this joy greater. Here Keats argues the importance of melancholy, a very important point to consider we are in an "extroverted age" and a "Happy age" where everyone must be rousing and celebrating and having fun at the expense of thought and quiet reflection. Like the previous 2 odes, melancholy is yet another piece in the puzzle to find inspiration and solace in art. It does have a conclusion, but is essentially unresolved - because we know the speaker suffers having to put up with misery, lack of inspiration and the inability to fulfil his imagination. The true resolution comes in Ode to Autumn, critically acclaimed as Keats' best ode, being perfect and written in iambic pentameter. The other odes don't follow this strict rule so closely, which helps to add tension, drama and sincerity to the poem, but it does have a certain unbalance unlike the more peaceful and regular Ode to Autumn. Unlike the other odes, there is no strict virtue or lesson in Ode to Autumn, nor is it metaphysically complex. Perhaps that is its wide appeal, the way Wordsworth's "Daffodils" is better known and loved than say The Prelude. Remarkably, unlike the unfulfilment in the other odes, autumn here is presented as fertile, and the grain is in harvest, and the weather is calm and the scenery lovely. This verse speaks for itself. Autumn can be found in its produce, the grain, the gentle winds, flowers, and the produce of the cyder-press (possibly apple cider?) Overall, abundance and fullness. The impression is of calmness and the slow moving of time. Though autumn will result in death and decay, the seeds of the harvest will be grown and sprout in spring, and produce fruition in summer later on. Unlike the bees the speaker knows autumn is transitory, however, which may add some melancholy. Spring is overrated compared to autumn, which has its distinct beauties. This is a poem not to analyse, but to enjoy, and the last lines convey that pleasant sense of tranquility. And yet the poem has its underlying sadness, not as sad or obvious as the others, but still there, according to Keatsian, because autumn is on the brink of winter. If it is alluded to, it is done so very subtly. It says too that the speaker has learnt his lessons on the previous odes, and is content to enjoy autumn. He has accepted that life is a cycle of life and death, and after winter will come spring and summer. This makes this poem more realistic and less fantastic than the other great odes, Nightingale and Grecian Urn. While in those he is either forced to accept reality as something inferior to fantasy, or preferring to live in his imagination, in Ode to autumn he is content that winter will pass, and autumn will come again. It seems Keats preferred autumn to spring, and there is something melancholy about the choice. Spring is typically personified as beauty and the preferred season, and after spring comes summer, growth and fruition. Autumn however is just before winter, a time of death, which makes it melancholy - but then Keats thrived on melancholy. There is much more emotion here, when the harvest is contrasted with death and decay, and the speaker looks forward to another cycle of life and death. Autumn is that precious time you have just before winter, which isn't even mentioned directly. What I like about the Odes is that it seems to be a progression in the growth of a person - say, a poet, because they reflect Keats more than his other poems do. He whinges about immortality in Nightingale, claims truth is superior to the ideal in Grecian urn while preferring the ideal, and worships melancholy - which may appear to be one-sided, trying to settle for the not-so-favoured thing because that is how life works, and trying to persuade himself it is all for the best. Only in Autumn does he begin to appreciate truly the beauty around him, and there is less melancholy, because the previous odes are not so much about contentedness as trying to see a silver lining in a cloud, but in Autumn, he is truly happy because he knows spring, summer and autumn will come again, and replace winter in a cycle of seasons. He has something to look forward to, and unlike the previous odes which dwell on his inner self, autumn is about the external surroundings (Though arguably that things come in cycles could apply to not only seasons, but other things.) He has accepted the fact that death will come, but he has reason to rejoice because it will not last. The Romantics popularised the inner pysche, and even had gothic demons residing in one's soul, and that could be why the Romantic poets have survived better than their predecessors, and outlast their successors in fame and reputation. It is also interesting to note Ode to Autumn is less passionate than the other 3 inspired odes, and exudes calm. It is more pastoral than anguished and introspective. There are two other odes, Ode on Indolence and Ode to Psyche, less critically acclaimed nowadays though more popular in their time. Ode on Indolence is seen to be an outpouring of personal idleness, and lacks the rich vividness of the other odes. It is simple to read, but I haven't analysed both these odes. The speaker, however, has learnt his lessons from indolence in this ode, by the time he speaks in Ode to Autumn. The Odes and the 1819 poems, seen as Keats' most productive year, were more favourably reviewed than his earlier poems, and the structure and versification was tighter and more powerful than Endymion and Isabella, and finally Keats was possibly on a new stage of his career. Unfortunately he wrote nothing of note later, fell ill and died of consumption in 1821. In the 1820's, Charles Lamb had much praise on the narrative poems, the more famous and popular in the 19th century, but today scholars and students are more likely to know and praise the odes, and those who read the narratives tend to be enthusiasts. When Keats first published his poetry, he was criticised by the Quarterly Review, a Tory magazine, as an upstart from a "Cockney school" of poets - which included Leigh Hunt. That Keats was ignorant of ancient Greek and yet wrote about Greek mythology seemed presumptuous He was also perceived as too sensuous, lingering over one sensation for a long time, instead of being rational. Even his verse has the sense of intense feeling and lurxuriousness about it, the texture of the words are somewhat thicker (and I can't explain why) and more potent than say the sonorous Wordsworth. In this aspect, his vivid sounds are reminiscent of Coleridge, each weighing very much, unlike prosaic Wordsworth. Still Keats seems to luxuriate more than Coleridge, who is more musical and balanced. Keats is an example of pure Art - he does not go and champion radical causes, like many other poets (Wordsworth, Coleridge, and Shelley - even Byron) but prefers to dwell in Beauty. There is something very pure in this, and what is more, his poems themselves exemplify his worship of Beauty - because they do not merely spell out content, their very words and phrases are beauty. You do not merely read them, but you feel them. Later on, in the 1840's, his name was revived by the Pre-Raphaelite painters, who were inspired by his works to paint scenes from his poetry. The very sensuousness, idea of past, myth and luxuriousness are present in the Pre-Raphaelites (note Rossetti, Millais, Holman Hunt, Burne-Jones etc.) who were also inspired by Tennyson, a then-contemporary Victorian poet. Now Tennyson was influenced by Shelley, and possibly Keats, for the Shelley worshippers at Cambridge where Tennyson was (including his best friend Arthur Hallam) admired Keats too, who was the subject of Shelley's poem Adonaïs. But unlike Keats, whose feelings and philosophies make an impression on you, Tennyson's feelings seem milder and less humane, less immediate, and less convincing.